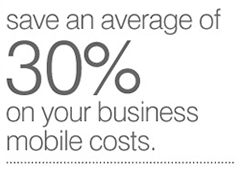 "35% conversion from targeted email & microsite." 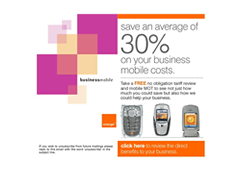 (ORANGE MOBILE'S LARGEST INDEPENDENT DISTRIBUTOR). 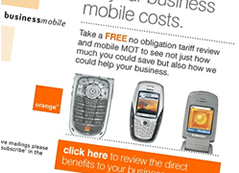 Part owned by Orange, Mainline are Orange Mobile's largest independent distributor. We created an email campaign to promote Mainline's business tariff to small businesses through a demonstration of savings and service. Utilising their existing tariff, a calculator demonstrates their specific savings if they switched provider. Supported by case studies within their market sector and some short prep questions to aid the sales team we achieved a 35% conversion rate. previously known as Decifer Solutions Ltd.
Concepts & strategies © Design Sense/The Interactive Business Enterprise Ltd. 1993-2016. All rights reserved..